Fast Drinks is a fast-growing supplier of vending machine consumables. Stocking many of the leading brands and vending solutions, including in-cup, singles, bulk and fresh bean coffee, Fast Drinks offers 24/7 access to vending machine food and drinks. Thanks to nationwide coverage, many businesses benefit from the smooth and efficient ordering and delivery service offered by Fast Drinks. Our brief was to create and build an e-commerce shop which would enable Fast Drink clients to place orders quickly and securely. The requirements for the online shop were very specific, so we chose a custom build which could integrate an OpenCart system for prices and products. One of the most important requirements was to allow clients to create and repeat orders without the need to enter credit card details. We ensured the ordering system enabled invoices to be processed at the Fast Drinks main office, where credit accounts and payment invoices were dealt with. This resulted in a much faster and more satisfactory experience for clients, and meant the website integrated smoothly into non-web-based systems. The website was built on a WordPress platform, but with custom-build pages which connected to an external database for the most up-to-date product information. The products are also sold in another online shop, so connecting the website to the existing product database was the most efficient solution. 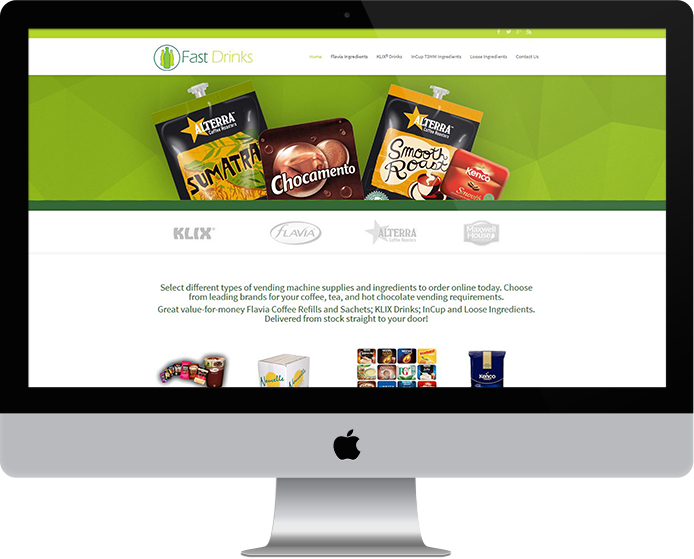 The resulting Fast Drinks website boasts a clean and clear design, and a user-friendly ordering process.